Darjeeling: GTA chief Binay Tamang's decision to hold regular interactions with the Bengal government over the past few months seems to be bearing fruit with the state announcing a series of initiatives for the hills. "We are clear in our minds that since we are running the Gorkhaland Territorial Administration, which is under the state government, it makes sense to work closely with the Bengal administration," said a Gorkha Janmukti Morcha leader who is close to Tamang. Following Tamang's initiative, the state has decided to set up a university in the hills and the government is currently looking at various plots to finalise the location. "A university with a different academic calendar for the hills will definitely be a big boon," said a teacher. Apart from the university, the state government has also handed approval letters to 429 secondary teachers that were pending since 2010 and the School Service Commission has validated the appointment of 137 volunteer teachers in the past one month. "Demand for compensation for those killed in the recent statehood agitation has been fulfilled. School teachers have been given salaries for the entire strike period, while other government employees are also getting pay equivalent to that of two months," said another Morcha leader. "The state government has also agreed to pursue the demand of granting tribal status to 11 hill communities." The government also approved the establishment of fire stations at Sukhiapokhri in Darjeeling district and Algarah in Kalimpong district. "The DMs of both the districts have been asked to identify the land while the state has already given its clearance for the project," said a GTA official. The state is helping the GTA brand its produce and the government has already agreed to help small scale farmers by providing them with modern machineries and tools, said the Morcha leader. Tamang, however, said he was looking forward to the Hill Business Summit that will be held in Darjeeling on May 13 and 14. "If we can manage to attract big time investors to the hills at the meeting, it will go a long way in strengthening the hill economy," said Tamang. Sources said the GTA had identified about 1000 acres of land across the hills that would be shown to potential investors during the business meet. 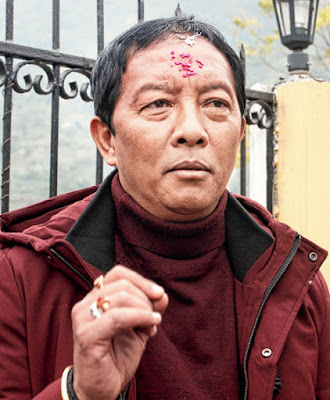 GTA chief Binay Tamang's decision to hold regular interactions with the Bengal government over the past few months seems to be bearing fruit with the state announcing a series of initiatives for the hills.